After much anticipation and countless hours of product development, John Deere has unveiled three powerful and productive L-Series utility wheel loaders. The 524L, 544L and 624L offer customers an intuitive solution, ideal for projects that require agility and versatility on the job site or farm, according to the manufacturer. 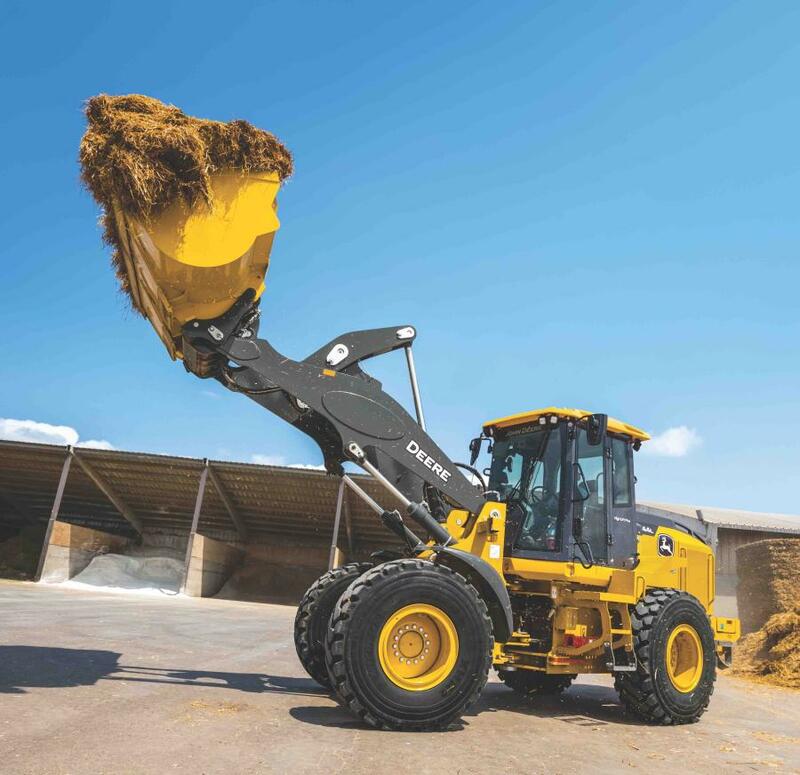 Designed with the operator in mind, the L-Series machines incorporate several new features, including improved cabs for more comfort and visibility, electrohydraulic (EH) loader controls for easier operation and redesigned near-parallel linkage, and enhanced performance buckets. 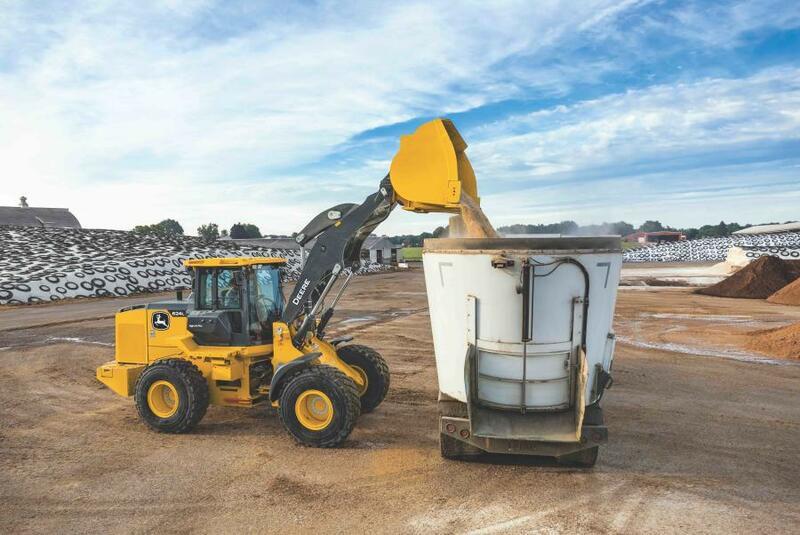 "Our next generation of wheel loaders improves upon the legacy of the John Deere wheel loader line," said Chris Cline, product marketing manager of utility wheel loaders, John Deere Construction & Forestry. "The L-Series boasts several improvements over previous models designed to positively impact productivity, comfort and visibility, resulting in increased profitability." The most notable of changes to the L-Series from their K-Series predecessors is the improved cab, which is roomier and more comfortable, offering more functional storage and floor space. The optional premium heavy-duty air suspensionseat is heated, ventilated and designed to offer additional legroom. The HVAC performance also is enhanced, now including rear defrost, increasing air flow while reducing noise. Three standard 12-volt auxiliary power ports in the cab enable the operator to charge multiple devices. Optional remote-heated, adjustable mirrors increase job site visibility. Improvements to the machine boom structure directly result in increased productivity. The design increases visibility to the coupler, bucket or forks, reducing overall cycle times, material spillage and equipment damage. Additional bucket options include enhanced production buckets with integrated spill guards, profiled side cutters and greater rollback, improving bucket fill and material retention. A new shaft-style fork design offers more visibility and tine length options, including 48-, 60- and 72-inch. Smoother boom and bucket hydraulic kickouts reduce operator fatigue, while new standard parallel lift linkage improves load leveling, limits bucket spillage and increases fork operation speed. The 524L, 544L and 624L are available with optional High Lift (HL) and High Lift Plus (HL Plus) selections; there also is a tool carrier option on the 524L and 624L models. The HL Plus option features hinge pin heights that are 12 to 13 inches higher than current HL pin heights, allowing the operator to dump into higher trucks or wagons. The tool carrier option provides the best centerline visibility to the coupler or forks. It is ideal for customers handling materials, like pallets, pipe or logs, where centerline visibility is important. The 524L, 544L and 624L feature fuel-efficient Final Tier IV John Deere diesel engines (6.8 L) and boast 152 (113 kW), 166 (123 kW) and 192 (143 kW) net peak horsepower, respectively. 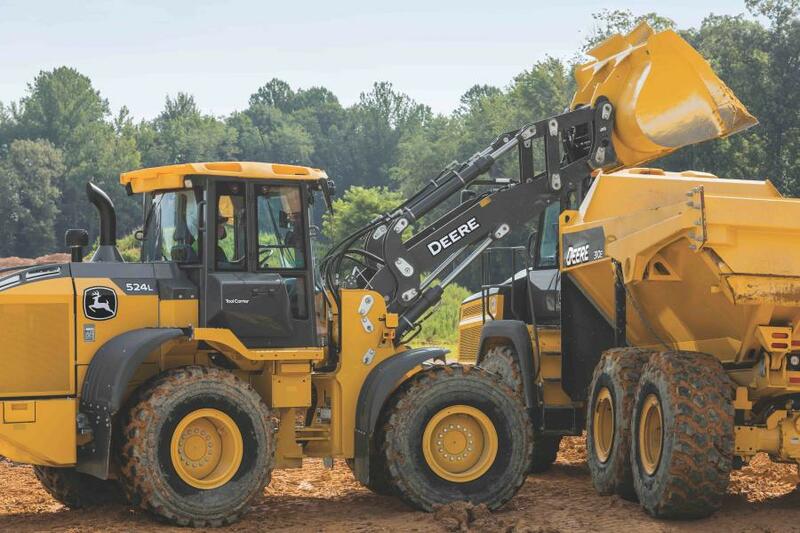 Fleet managers looking to get the most out of their L-Series wheel loaders can rely on their John Deere dealers to provide Ultimate Uptime, featuring John Deere WorkSight. With Ultimate Uptime, owners receive predelivery and follow-up inspections that include five years of JDLink telematics, machine health prognostics, remote diagnostics, programming capabilities and the ability to add dealer-provided uptime solutions to a customized package. The 544L also will be on display at World of Concrete, Jan. 22-25, 2019, at booth C5451. Alongside the 544L will be a JD544, built in December 1968, to commemorate 50 years of John Deere building wheel loaders. Contractors, builders, and sand and gravel-pit operators alike helped build the innovative JD544 50 years ago. Throughout 2019, all new manufactured wheel loaders will showcase a 50 year anniversary emblem to signify this milestone.